Deb's Cup of Tea: I Won! 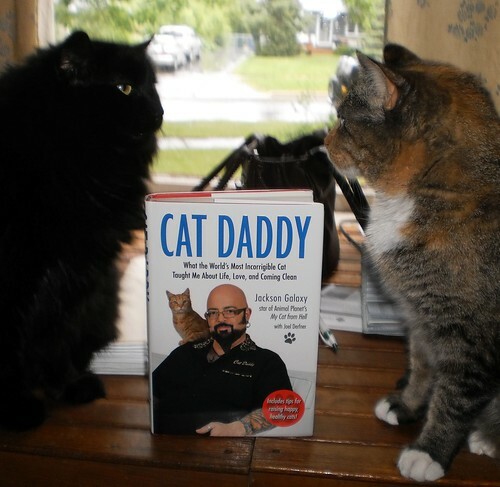 There is a blog to the right, Cat Wisdom 101, which was running a contest in conjunction with the release of "Cat Daddy" by Jackson Galaxy. If you don't know Jackson's name, you might recognize his TV show on Animal Planet, "My Cat From Hell". For those who don't know the program, Jackson makes house calls to the homes of cat guardians who are at their wits end dealing with a feline who is not socializing well. In some of the programs I've watched, I almost wonder if he ever thinks, "These people shouldn't care for a cat. Period." He always winds up helping both the cat and the guardian live together and thrive. I don't have cats from hell. While we don't always have sunny skies, we don't have the viciousness, terror and anger that some of the cats Jackson deals with exhibit. Yet, every time I have a chance to watch the show, I learn something, from how to pet the girls to how to play with them to arranging the living space so they will feel at home, something, that enriches all our lives. 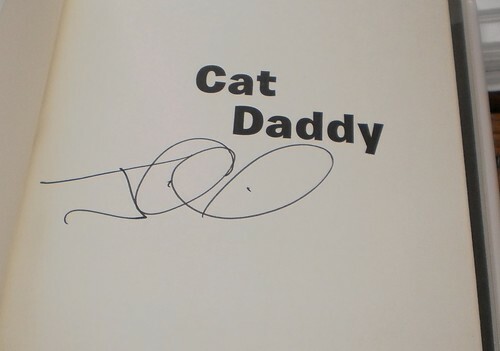 Cat Wisdom 101 was giving away an autographed copy of the book. All I had to do was leave a comment. On May 20th, I checked back to the blog and saw this. My heart jumped a beat. I think the Deb N'Cats is me. I don't remember. It was over a week ago. Yes, I think that's me. OMG! I won! The book arrived yesterday. Today, I removed it from the wrapper and gave it a 'cat scan'. It passed. Actually Mija spent quite a bit of time rubbing the edges. I would imagine there was a curious new book smell to this. And yes, it is autographed, not personally, but autographed nonetheless. I think I shall start reading this over the coming weekend, once I get the deck chairs out of the storage box. It's rare for me to win anything so I'm thrilled. I'll have a review once I'm finished. P.S. If you need any wisdom on living, loving and caring for a feline, check out the blog Cat Wisdom 101, conveniently bookmarked to the right. Today's question is one I submitted. This made my day! Sharing and connecting with fellow cat lovers is what I love about blogging. Enjoy!